Six inches of ash settled on the ground beneath smoke so thick, it cloaked the stars. That’s what remained of Betsy Ann Cowley’s two-story house when she returned to Pulga last Monday, four days after the deadliest and most destructive wildfire in California history started less than a mile from her doorstep in rural Butte County. The blaze appeared to have touched down at random, razing her home but not the guest lodging, and, nearby on the property, destroying a cabin but not the historic schoolhouse. An airstream trailer seemed to have exploded from within, but the vegetation just feet away was spared. 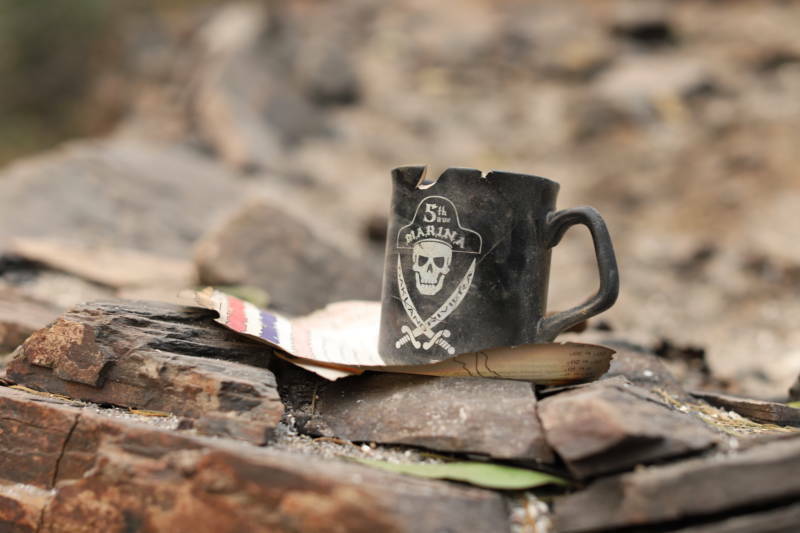 Cowley showed me the sole object she recovered from the ash of her house: a coffee mug from the 5th Avenue Marina arts enclave in Oakland, a relic of the life she left behind in order to build an intentional community in the remote foothills of the Sierra Nevada Mountains. And therein laid Cowley's dilemma, one increasingly common in Northern California. Cowley had bought Pulga in part to provide refuge from the Bay Area housing crisis, only to move north and encounter an environmental nightmare. 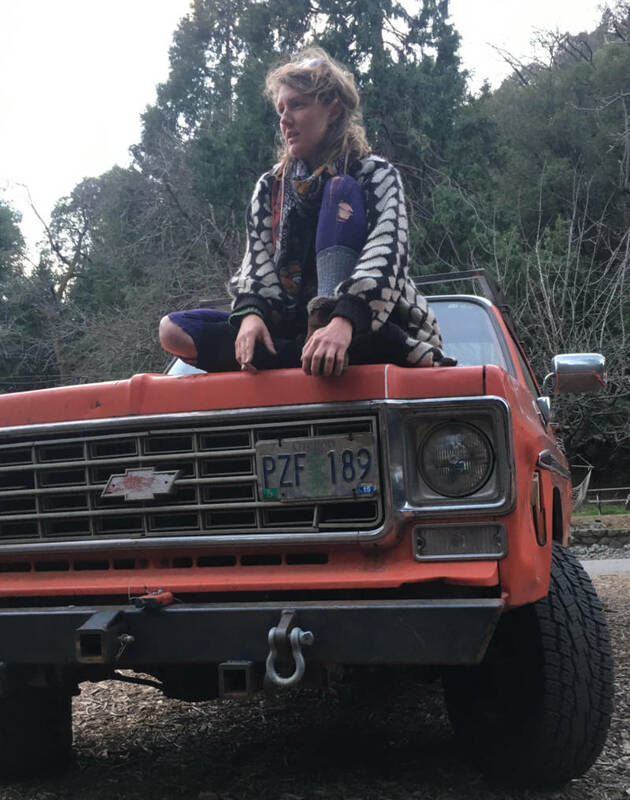 She brought farming and building skills gathered throughout her itinerant past to a dilapidated ghost town, and drew inspiration from Pulga’s past incarnations (hydroelectric-powered railroad and mining hub, counterculture bohemia, even hypnosis school) to work towards self-sufficiency. Now she's been dramatically set back. 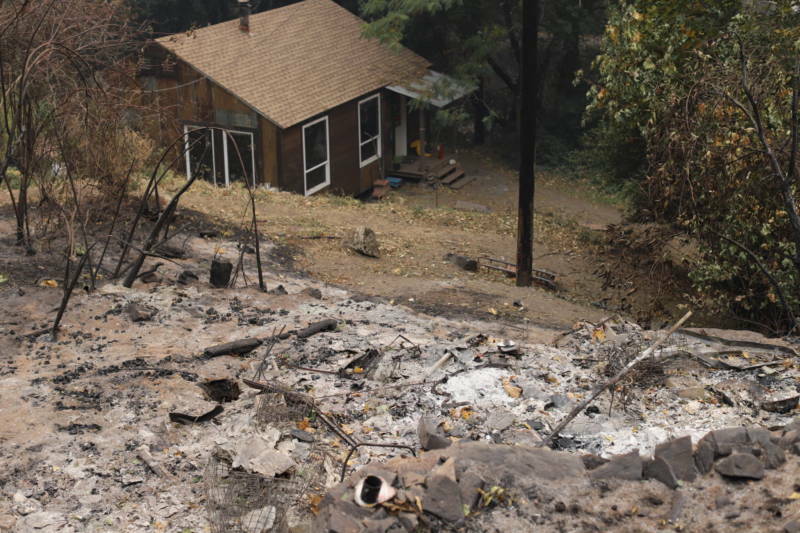 The Camp Fire, which started days after Cowley communicated with Pacific Gas and Electric about power-line maintenance on her property, has steeled her resolve to foster autonomy from statewide utilities. From her perspective, the blaze, which killed 76 with more than 1,000 still missing at press time, illustrates the hazards of a more networked region. Cowley was anxious, but relative to the safety of her friends in the region, seemed unconcerned with the damage to her property. Looking past the wan dust of her former home, she observed that the fire cleared part of an old road, one she'd previously only heard about. "It actually revealed so much history," she said. 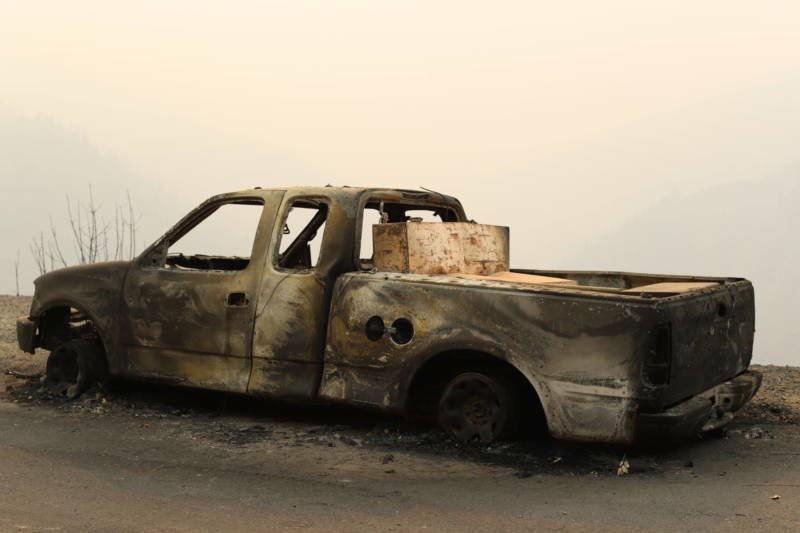 She'd returned in spite of an evacuation order and, like those who’d sheltered in place in nearby Concow and Yankee Hill, was subject to removal if she left the property. There was no power, and no running water—the fire ruptured her water line. At night, solar-powered lights dimly illuminated the small structures along Pulga Road. When I arrived, the road to Pulga was guarded by military Humvees and lined with the scorched shells of abandoned vehicles. Some were marked with pink and green ribbons to indicate they’d been checked for cadavers. Rock House, a diner built in part from locally sourced vesuvianite, or “Pulga jade,” was mostly rubble. Scooters, another eatery a mile further on Highway 70, stood intact. The parking lot teemed with first-responder and utilities vehicles. As the elevation increased, the thick smoke reduced visibility to roughly 100 feet. Pulga Road, located within the Plumas National forest, is the last left before the highway crosses Feather River Canyon. It clings to the side of a mountain, descends into a ravine, and then runs alongside Flea Valley Creek. Dozens of renovated cabins and new “glamping pads,” as Cowley advertises them to retreat clients, dot the hillsides. The road ends at the train track, a commercial route that once brought passengers from Oakland. Cowley emerged from the office cabin to greet us on Wednesday morning. Like most of the residents we encountered in the evacuation zone, she wasn't wearing a mask. A gas generator whirred as chickens roamed freely among tapped fire extinguishers. She'd been away when the fire started, and returned to find smoldering stumps and coal-like embers dropping from trees. Before Pulga, Cowley moved often, learning to cultivate and prepare food in both ideal and less-than-ideal conditions. In Pittsburgh, she gardened on a block full of condemned houses. In New Orleans, she worked in culinary landmark Bayona. In Oakland, Cowley settled into a boat, September Wind, amid the artists and craftspeople of the 5th Ave. Marina while managing a farm near Sacramento. After a wildfire at the farm, she brought her goats to the urban waterfront. At the Marina, Cowley and her peers lived in the shadow of the incoming Brooklyn Basin development, an enormous mixed-use project representing an existential threat to their affordable shoreline community. (The residents of Shadetree, one complex within the marina, recently rallied to cooperatively purchase their home.) “We felt the city’s instability constantly,” she said. In March 2015, Cowley bought Pulga for $499,000 in partnership with her stepfather, the class-action attorney Charles “Bucky” Zimmerman. The property's seller was Lorraine Paloma, who’d lived there for years with Fred Leidecker; he ran the Mystic Valley Retreat, advertising it as a school of “paranormal hypnotism and enlightenment.” (Celebrating the transaction, Leidecker hypnotized several of Cowley’s friends.) 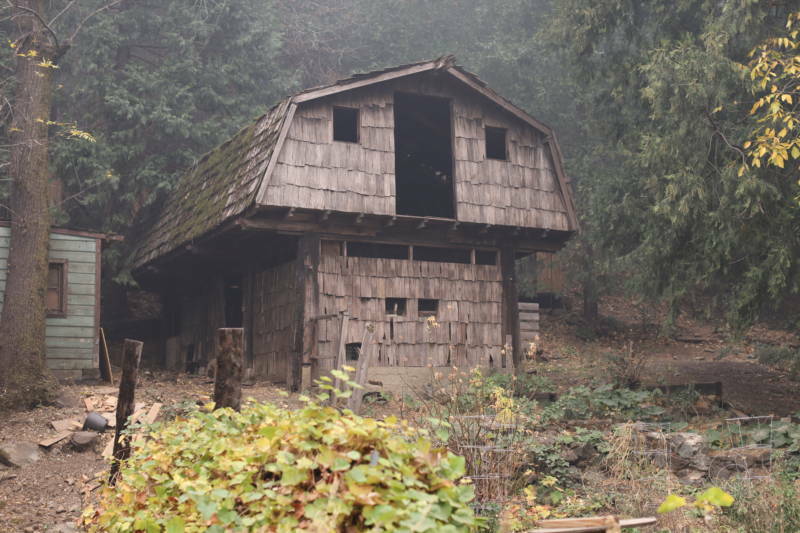 Pulga was in disrepair, with only one habitable structure, but Cowley was enamored of it and its natural spring. 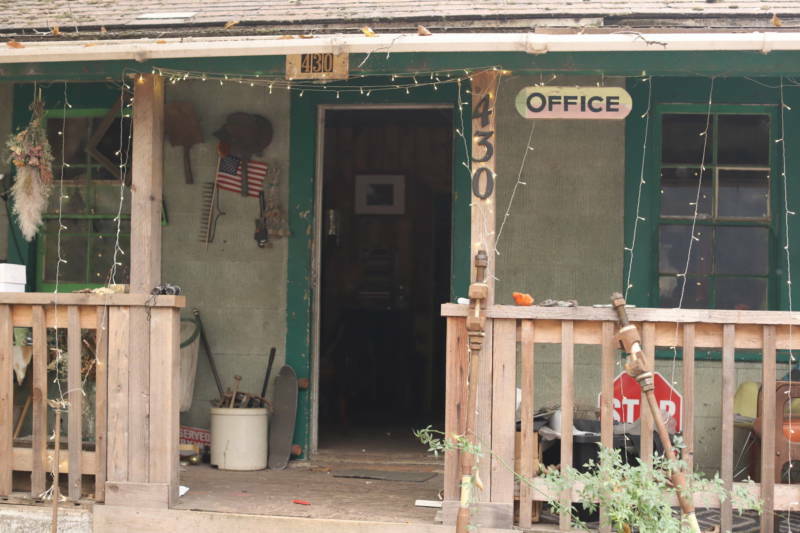 Jessy Brown was living in a trailer outside an Oakland warehouse when Cowley invited her north in 2015. The city was beginning to feel impossible, she told me, and Cowley’s vision of a rotating cast of residents and visitors in Pulga was contagious, even though the pipes froze, pigs knocked down the front door, and inconsistent internet access foiled her plans to continue working as a freelance prop designer. As Brown and Cowley hauled away tons of garbage, they discovered overgrown foundations and other signs of the town’s past. “It got to the point that I could tell what was an ancient kit cabin from Sears, and what was even older,” Brown said. They also connected with the Yankee Hill Historical Society, hosting the group in Pulga’s former schoolhouse. On Thursday, after eating grilled vegetables and sleeping in a guest cabin, Cowley urged me to visit Jeff Evans, a member of the historical society, in nearby Concow. Evans lives with his parents, who are in their 90s, on a dirt road near Lake Concow. The fire came too quickly for them to leave. Cars were abandoned less than a mile from their home; the drivers had fled on foot, plunging into the frigid water of the lake to stay alive. Evans, marooned in the evacuation zone like Cowley, asked if we could bring wine and gasoline. He was caring for eleven dogs, some badly burnt. The area, he said, looked like a moonscape. Evans sat with his father, Chuck, and his neighbor Virginia Wildblood in the dining room under a wavering light. They recalled the morning of the blaze: seeing smoke on the horizon and then, minutes later, being in the eye of a firestorm. The wind huffed like a freight train. They used a tractor and hand tools to move dirt, improvising a firebreak. The short version is that the earliest European arrivals in Pulga and Mayaro, another once-bustling town nearby, were capitalist frontiersman. William King, a railroad geologist, established Pulga in the 1880s. 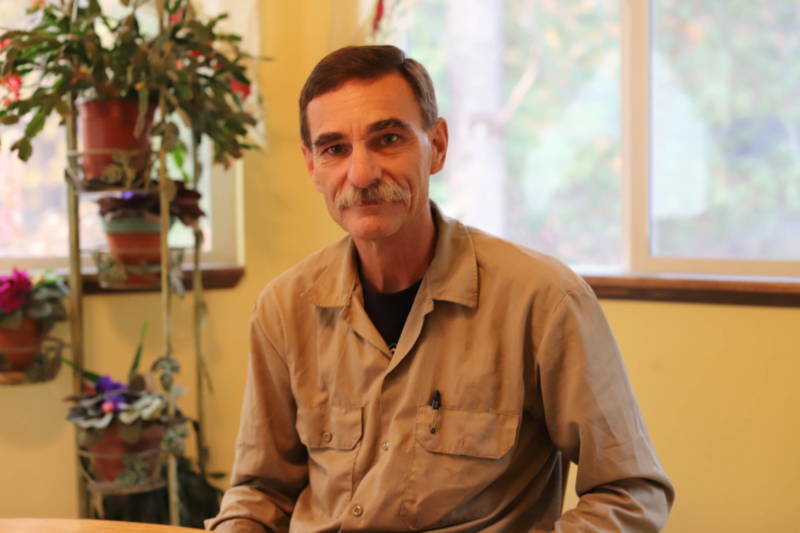 “He was the only one who knew the railroad was coming through,” Evans said. “So he bought as much land and mining rights as he could.” The Phelps, another early Feather River family, founded Mayaro in anticipation of a road that was never built. In the early to mid-20th century, Pulga and Mayaro thrived on mining and railroad traffic, with several hundred residents. 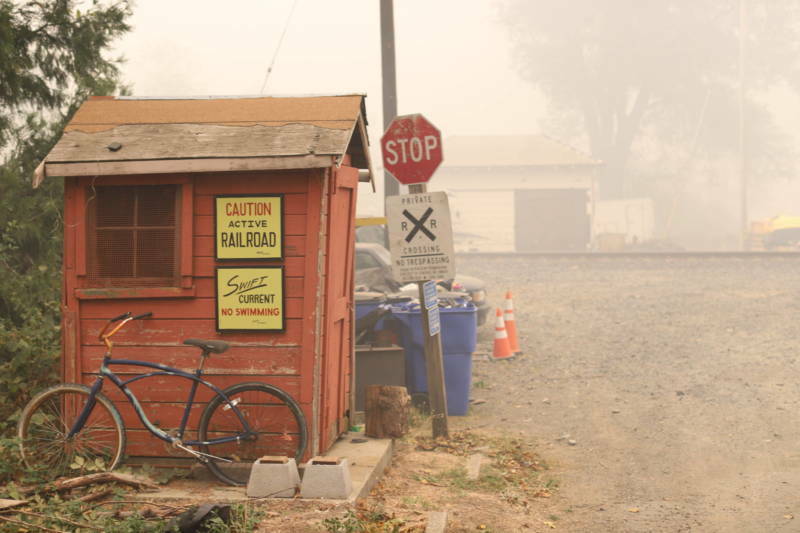 According to documents shared by Evans, the Western Pacific Railroad ran a steam passenger train called “The Skunk” from Oakland to many of the small towns along the Feather River Route. An Oakland family, the Lovetts, marketed Mayaro Lodge to Bay Area residents as a rural getaway. Pulga and Mayaro, the Evans recalled, were as much destinations for revelry as for business. By the late 1960s, mining was near-bust, and the railroad had discontinued regular passenger service. It was fertile ground for the back-to-the-land movement, and Chuck Evans said “nudist squatters” overtook Mayaro Lodge. 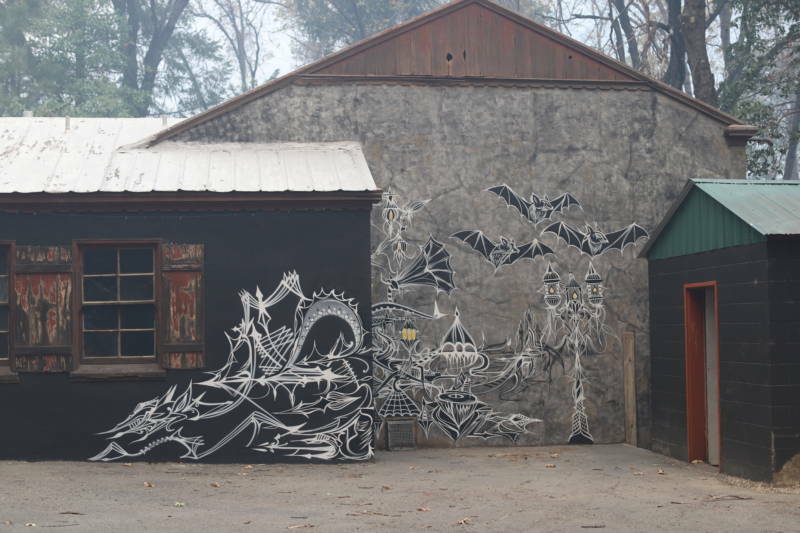 In Pulga, dozens of artists and craftspeople lived semi-communally with a surviving descendant of William King. “I didn’t mean to become a wedding planner,” she said. “If you’d asked me two years ago to hold a corporate retreat, I would’ve laughed.” But some clients, such as reproductive rights group If/When/How, are inspiring, and she’s come to see the rentals as an opportunity to promote a different future to urbanites, savoring the way visitors from the Bay Area in particular receive Pulga’s country facts-of-life as epiphanies. “People are amazed to be eating a pig, and then to look over and see the fruit that the pig ate,” she said. Meanwhile, Cowley has developed complicated feeling towards the utilities and agencies operating in the area, growing fond of their blue-collar workers while resenting grander corporate designs for the region. For example, she’s vehemently opposed to expanding internet access. She recalled a PG&E worker complaining that he had to drive in to manually check Pulga’s meters, since they aren’t the company's networked SmartMeters. “I told him that’s his job security,” she said. 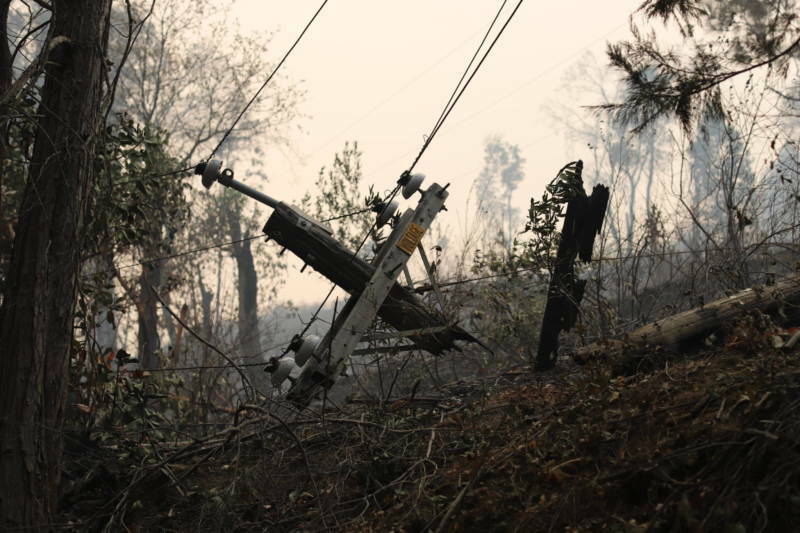 While digitized communications might seem like a security safeguard in the event of disaster, Cowley considers the Camp Fire a counterpoint—especially if it's definitely linked to power lines. She likes to point out that, in the early 20th century, Pulga ran primarily on hydroelectricity generated from the Feather River, a water source that today largely routes to corporate crops in Central Valley. The people in and around Pulga, in her view, are bound to a potentially hazardous utility—PG&E—and needlessly deprived of safer alternatives. Butte County isn't Marin, and Pulga shouldn't be confused with somewhere like Bolinas. Nor can it be compared to Camp Navarro, the Boy Scout camp-turned-corporate retreat outside Mendocino. The median household income in Concow and Yankee Hill, per census figures, is under $25,000, or less than a third of the median income in Sausalito. On Thursday, we visited a Walmart in Chico, where evacuees had formed a large tent city in the parking lot. It resembled homeless encampments in Oakland, and some of the people there said they'd moved to Paradise and Magalia, towns practically leveled by the Camp Fire, to flee the high cost of living in the Bay Area. In other words, the rural devastation may be hundreds of miles from the Bay Area, but it is closely linked to urban pressures. Cowley's vision for Pulga is prefigurative, imagining a sort of shadow society to escape the financial strain on coastal cities. But the fire has stressed to her the difficulty of outpacing the closely entwined forces of economic and environmental injustice in California. My last night in Pulga, Cowley and I spoke in front of the office cabin by the tracks. 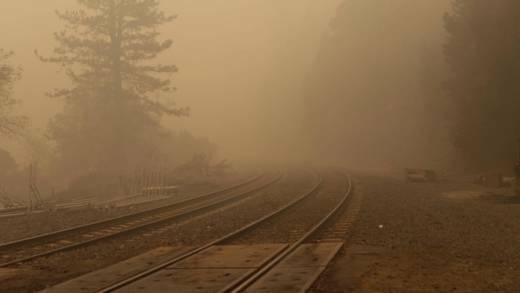 A railroad worker radioed to his counterparts about conditions ahead, protesting that he didn’t think it was yet safe to resume running trains due to encroaching flames. Cowley dwelled on the water line, calling the cleared vegetation an opportunity to rethink irrigation. But she’d have to hurry. “I already knew I had winter coming, and that’s a lot,” she said. “Now I have to redo the plumbing." The air was still thick with smoke as night fell, and Cowley realized that the wake of the fire promised another challenge.